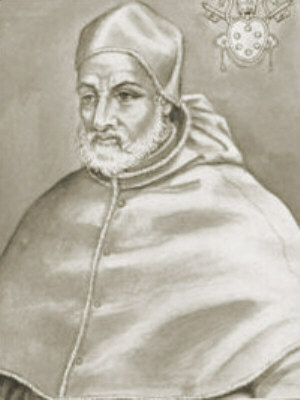 Pope Pius IV (31 March 1499 – 9 December 1565), born Giovanni Angelo Medici, was Pope from 1559 to 1565. He is notable for presiding over the culmination of the Council of Trent. Giovanni Angelo Medici was born of humble parentage in Milan, unrelated to the Medicis of Florence. His early career connects itself in some measure with the rise of his elder brother, Gian Giacomo Medici, from the position of a mere bravo to that of Marchese di Marignano. 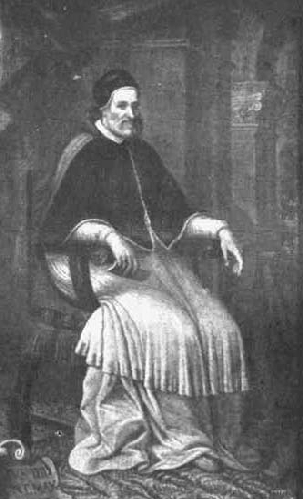 After studying at Bologna and acquiring a reputation as a jurist, he went in 1527 to Rome, and as the favorite of Pope Paul III was rapidly promoted to the governorship of several towns, the archbishopric of Ragusa, the vice-legateship of Bologna, and in April 1549, to the cardinalate. Meanwhile he had three illegitimate children. On the death of Pope Paul IV, he was elected Pope Pius IV on 25 December 1559, and installed on 6 January 1560. His first public acts of importance were to grant a general pardon to the participators in the riot which had closed the previous pontificate, and to bring to trial the nephews of his predecessor, of whom Cardinal Carlo Carafa was strangled to death, and Duke Giovanni Carafa of Paliano, with his nearest connections, beheaded. On 18 January 1562 the Council of Trent, which had been suspended by Pope Julius III, was opened for the third time. Great skill and caution were necessary to effect a settlement of the questions before it, inasmuch as the three principal nations taking part in it, though at issue with regard to their own special demands, were prepared to unite their forces against the demands of Rome. Pius IV, however, aided by Moroni and Carlo Cardinal Borromeo, proved himself equal to the emergency, and by judicious management – and concession – brought the council to a termination satisfactory to the disputants and favourable to the pontifical authority. Its definitions and decrees were confirmed by a papal bull dated 26 January 1564; and, though they were received with certain limitations by France and Spain, the famous Creed of Pius IV, or Tridentine Creed, became an authoritative expression of the Catholic faith. The more marked manifestations of stringency during his pontificate appear to have been prompted rather than spontaneous, his personal character inclining him to moderation and ease. On the other hands, others bemoaned the austere Roman culture during this papacy; Giorgio Vasari in 1567 spoke of a time when the grandeurs of this place reduced by stinginess of living, dullness of dress, and simplicity in so many things; Rome is fallen into much misery, and if it is true that Christ loved poverty and the City wishes to follow in his steps she will quickly become beggarly...". A conspiracy against Pius IV, headed by Benedetto Accolti, the son of a cardinal, was discovered and crushed in 1565. Pius IV, like many of his predecessors and successors, was a nepotist. Among the relatives he favoured, the main figure is that of Carlo Borromeo. Under his reign Michelangelo re-built the basilica of Santa Maria degli Angeli (in the Diocletian's Baths) and the eponymous Villa Pia, now known as Casina Pio IV and headquarters of the Pontifical Academy of Sciences, was designed by Pirro Ligorio in the Vatican Gardens. He died on 9 December 1565, and was buried in Santa Maria degli Angeli. His successor was Pius V.
B. 31 March, 1499, at Milan; elected 26 December, 1559; d. in Rome 9 Dec., 1565. The Medici of Milan lived in humble circumstances and the proud Florentine house of the same name claimed no kindred with them until Cardinal Medici was seated on the papal throne. His father Bernardino had settled in Milan and gained his livelihood by farming the taxes. Bernardino had two enterprising sons, both able to rise in the world by different roads. The oldest, Giangiacomo, became a soldier of fortune and after an adventurous career received from the emperor the title of Marchese di Marignano. He commanded the imperial troops who conquered Siena. Giovanni Angelo was as successful with his books as his brother with his sword. He made his studies first at Pavia, then at Bologna, devoting himself to philosophy, medicine, and law, in the last mentioned branch taking the degree of doctor. He gained some reputation as a jurist. In his twenty-eighth year he determined to embrace the ecclesiastical state and seek his fortune in Rome. He arrived in the Eternal City, 26 Dec., 1527, just thirty-two years to a day before his election to the papacy. From Clement VII he obtained the office of prothonotary, and by his intelligence, industry, and trustworthiness commended himself to Paul III who entertained the greatest confidence in his integrity and ability and employed him in the governorship of many cities of the papal states. In the last year of Paul III's reign, Medici, whose brother had married an Orsini, sister to the pope's daughter-in-law, was created cardinal-priest with the title of S. Pudenziana. Julius III made him legate in Romagna and commander of the papal troops. The antipathy of Paul IV was rather to his advantage than otherwise; for in the reaction which followed the death of that morose pontiff all eyes finally settled on the man who in every respect was Paul's opposite. The conclave dragged along for over three months, when it was obvious that neither the French nor the Spanish-Austrian faction could win the election. Then, mainly through the exertions of Cardinal Farnese, the conclave by acclamation pronounced in favour of Medici. He was crowned 6 Jan., 1560, and took the name of Pius IV. His first official act was to grant an amnesty to those who had outraged the memory of his predecessor, Paul IV; but he refused clemency to Pompeio Colonna, who had murdered his mother-in-law. "God forbid", he said, "that I should begin my pontificate with condoning a parricide." The enmity of Spain and the popular detestation of the Caraffas caused him to open a process against the relatives of Paul IV, as a result of which Cardinal Carlo Caraffa and his brother, to whom Paul had given the Duchy of Paliano, were condemned and executed. The sentence was afterwards declared unjust by St. Pius V and the memory of the victims vindicated and their estates restored. Cardinal Morone and other dignitaries whom Paul had imprisoned for suspicion of heresy were released. Pius IV now devoted his undivided attention to the completion of the labours of the Council of Trent. He was luckier than his predecessors in the youth whom he created cardinal-nephew. This was St. Charles Borromeo, the glory of Milan and of the Universal Church in the sixteenth century. Pius had the satisfaction of seeing the close of the long-continued council and the triumph of the papacy over the antipapal tendencies which at times asserted themselves. His name is immortally connected with the "Profession of Faith", which must be sworn to by everyone holding an ecclesiastical office. The few years which remained to him after the close of the council were devoted to much needed improvements in Rome and the papal states. Unfortunately for his popularity, these works could not be perfected without the imposition of additional taxes. Amid the numerous embellishments with which his name is connected, one of the most useful was the founding of the pontifical printing-office for the issuing of books in all languages. He procured the necessary type and placed the institution under the able superintendence of Paul Minutius. In addition to the heavy expenses incurred in the fortification and embellishment of Rome, Pius was under obligation to contribute many hundred thousands of scudi to the support of the war against the Turks in Hungary. The mildness of Pius IV in dealing with suspects of heresy, so different from the rigour of his predecessor, made many suspect his own orthodoxy. A fanatic named Benedetto Ascolti, "inspired by his guardian angel", made an attempt upon his life. A more formidable foe, the Roman fever, carried him off 9 Dec., 1565, with St. Philip Neri and St. Charles Borromeo at his pillow. He was buried first in St. Peter's, but 4 June, 1583, his remains were transferred to Michelangelo's great church of S. Maria degli Angeli, one of Pius's most magnificent structures. "Pius IV", says the fearless Muratori, "had faults (who is without them? ); but they are as nothing compared with his many virtues. His memory shall ever remain in benediction for having brought to a glorious termination the Council of Trent; for having reformed all the Roman tribunals; for having maintained order and plenty in his dominion; for having promoted to the cardinalate men of great merit and rare literary ability; finally, for having avoided excess of love for his kindred, and enriched Rome by the building of so many fine edifices."